NAKED KEYNESIANISM: Dr. Volcker, I presume? Great line today, even if unintentionally funny, in David Pilling's column (subscription required) in the Financial Times. He notes that many are comparing Raghuram Rajan, the new head of the Reserve Bank of India (RBI), with Paul Volcker, inflation hawk, and one time chairperson of the Fed. 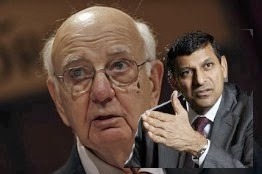 Rajan has denied the similarities, but as noted by Pilling: "if Mr. Rajan does not want to be seen as Paul Volcker, he has done a pretty good impersonation so far." Not sure that's what India needs with the economy decelerating, but I'll not delve into that right now. Raghuram Rajan is a twit. He thinks that that Keynsian stimulus involves incurring a debt that necessarily has to be paid back in future years. See this FT article.